Guinea pigs and an irrigation system in Peru. Guinea pig farming, a reforestation project and building a school for electricians: in 2017, the charity ‘Förderkreis Cajamarca e. V.’ received 3000 Euro for these three projects from Charity Cat, just like in the previous year. Charity Cat has been supporting this charity, which carries out different projects together with its partnered association “José Dammert Bellido” from Bambamarca, Peru, for several years. All initiatives aim to help provide a secure income and food for poor families and their children in the peruvian province Cajamarca. 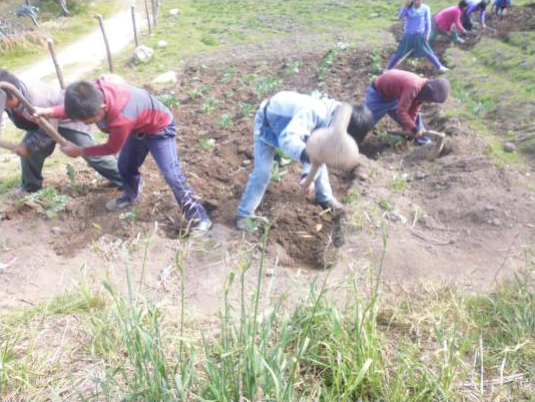 Two examples of projects, which Förderkreis Cajamarca was able to carry out in 2017, are a new watering system for the school garden and helping poor farmers raise a new breed of guinea pigs for meat. In 2016, the association “José Dammert Bellido” and families from the local community built a new reservoir for their small natural water source. In 2017, they started making use of the water, by building a new irrigation system for the school garden. The parents of the schoolchildren built a drip watering system, which is inexpensive to build and which saves water and nutrients. Broccoli, cabbage, potatoes and carrots are just some of the vegetables the kids got to harvest and eat as part of their lunches later on thanks to the new system. Certainly a healthy school meal! Guinea pigs have formed a meat source for the people of the Andes even before the times of the Incas. In 2012, there were 12,7 million guinea pigs in Peru, 2,4 million of them in Cajamarca. These animals are easy to keep and are fed mainly with kitchen waste, which means most campesinos have them in their homes. However, the traditional way of keeping them is not very profitable. This is why the association “José Dammert Bellido” had the idea to purchase and breed animals from an improved type of guinea pigs. The project will help farmers who are too poor and who have too little land to buy cattle. 30 small farms will profit from this project – they have to invest some of their own money, but then get a number of animals, stables and courses on how to keep and breed the guinea pigs.